Cuisinart is a highly reputable brand known for manufacturing high quality coffee makers and machines. Each model has its own distinct set of features and performance level. The Cuisinart DGB-625BC Grind-and-Brew 12-Cup Automatic Coffeemaker is a great coffee maker that is packed with tons of features but also offers consumers a consistent level of performance. What’s best is the coffeemaker automatically grinds the beans so you can always enjoy a fresh cup of coffee. 12-Cup Coffee Maker with Built-In Bean Grinder: The coffee maker automatically grinds the beans before brewing. This allows users to enjoy a delicious cup of fresh coffee that delivers the freshest coffee flavor. Fully Programmable: The Cuisinart DGB-625BC Grind-and-Brew 12-Cup Automatic Coffeemaker is fully programmable. This coffee maker includes various features, including grind-off option in case you are using pre-ground coffee, 1- to 4-Cup setting, auto-shutoff from 0 to 4 hours and brew pause. ​Charcoal Water Filter: The Cuisinart DGB-625BC Grind-and-Brew 12-Cup Automatic Coffeemaker features a permanent charcoal and gold tone water filter that helps extract the freshest coffee flavors. Includes: The Cuisinart DGB-625BC Grind-and-Brew 12-Cup Automatic Coffeemaker includes an instruction booklet and a measuring spoon. 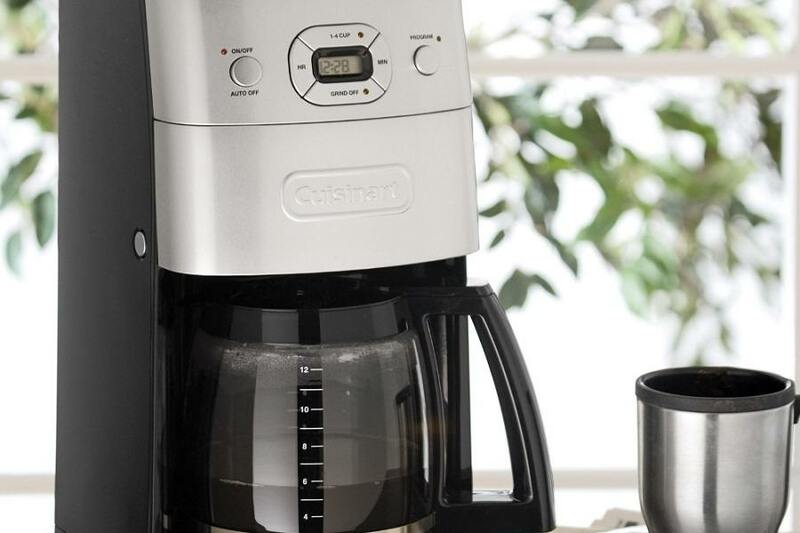 Convenience: The Cuisinart DGB-625BC Coffeemaker features an automatic grinder. This eliminates the need for you to invest in a separate grinder. Easy Setup: Despite the number of features the device has, it is still quite easy to set up. 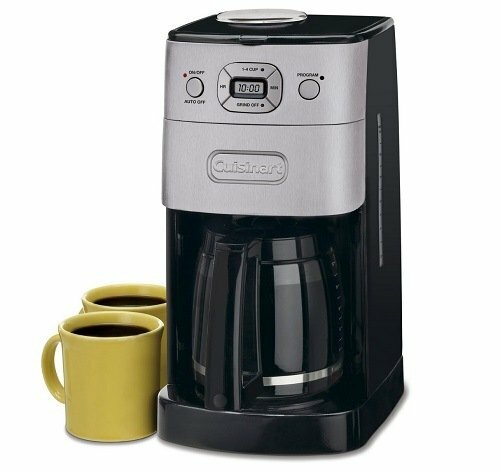 ​Visually Appealing: The Cuisinart DGB-625BC Coffeemaker is overall a great coffee machine that looks visually appealing and will sit nicely on your kitchen counter. Pause and Serve: The Cuisinart DGB-625BC Coffeemaker has a handy pause and serve feature, which makes it possible for people to pour cups of coffee during the brewing process. Cumbersome to Clean: With 6 removable parts, the Cuisinart DGB-625BC Coffeemaker is quite difficult to clean. Tall Machine: The machine is quite tall, at 15 inches, and might not fit in most cupboards. ​Noisy: Several Amazon consumers have complained about how noisy the Cuisinart DGB-625BC is because of the grinder. However, this should not be a big problem as grinders are typically noisy. ​Manual Dosing Required: One minor con of the Cuisinart DGB-625BC is you must measure out the exact amount of beans you want. No Adjustable Grind Setting: This is probably one of the biggest downsides of the machine as most people like to experiment with different grind options. The Cuisinart DGB-625BC Grind-and-Brew 12-Cup Automatic Coffeemaker is available on Amazon for $72.92. Considering its low price tag, the Cuisinart DGB-625BC Grind-and-Brew Automatic Coffeemaker is a good deal despite its minor flaws and will sit proudly in your kitchen.